Generally I expect an Avengers comic to be action packed and full of some great team-ups. Issue #5 has that, which I’ll get to later. It had some insight revelations about how closely tied the Marvel Universe happens to be to the Celestials. It’s very deep for The Earth’s Mightiest Heroes. 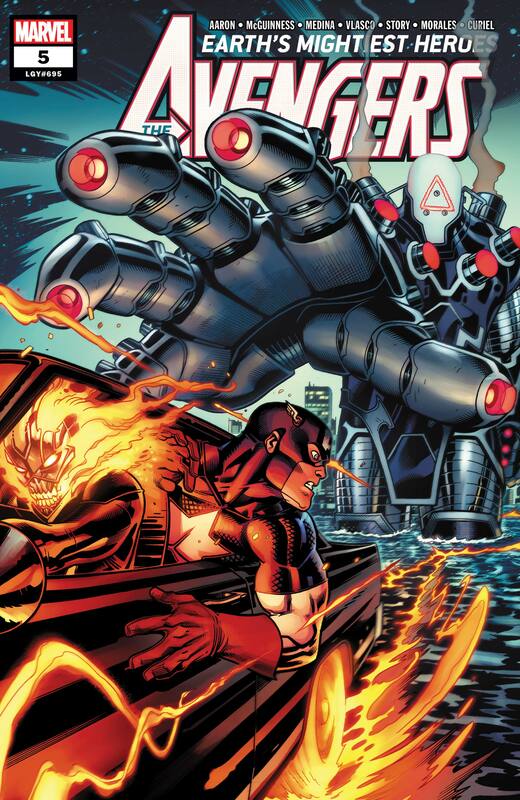 The other question…How powerful is Ghost Rider? Is he powerful enough to take on the god of mischief? If you didn’t know Loki is our classic Avenger’s baddie. NO Spoilers if your this far into this run. The questions have been asked. The best part of this issue is that Aaron finally brings all the good guys together in one place to fight the final fight. Remember that team-up I mentioned and the battles. This issue sets up a really cool Shogun Warriors sort of thing. You’ll get it when you see it. The changes in artwork between McGuinness and Medina isn’t distracting. Their independent styles are well matched for this book. This issue continues to set up a potentially classic battle in Mighty Marvel fashion. Hold on for the next issue.